THE IDIOTS' BOARD: LOVERS OF PA-RES. 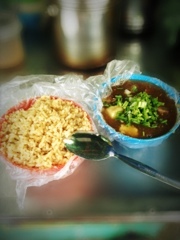 There's no clean food that satisfies a hungry stomach, in contrast to this claim, pares (pa-res) though not so clean, has it. The truth of being a street food refutes the idea of a clean and healthy food, thus you think so.